I came up with this recipe for my other website, TrailCooking. But yum, it was good – so tasty I needed to share it and share it also in a standard kitchen recipe. To see the backpacker recipe, head over. well worth sourcing out for their superior taste! Bring the milk to a boil, add in the dry ingredients (except for the nuts). Cover tightly, take off the burner and let sit for 10 minutes. Stir in the nuts. 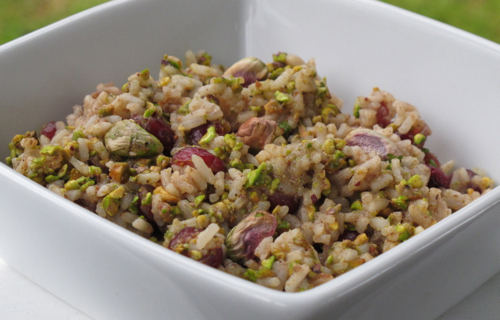 Instant brown rice can be used, give it a full 15 minutes sitting time. ¼ cup shelled pistachios are about 50 of the nuts. Use a lightly salted and roasted for best taste. Reserve a couple of whole ones to decorate the pudding.